Streets of Rage 2 is one of the greatest 2D action brawlers ever made and joins the pantheon of classic games like TMNT, The Simpsons, Double Dragon, and Final Fight. While Streets 2 has smooth controls, gritty bright environments, and outstanding music, it’s the narrative that gets expressed through the levels that makes it compelling enough to stand the test of time. Streets of Rage 2, known as Bare Knuckle II: The Requiem of the Deadly Battle in Japan, came out in North America on December 20th, 1992. The leader of the evil Syndicate, Mr. X, has returned and kidnapped your partner, Adam. Adam’s younger brother, Skate, asks Axel and Blaze (the heroes of the original Streets of Rage) for help. With the aid of professional wrestler, Max Thunder, they take to the “streets” full of “rage.” Each players has unique abilities and skills, utilizing rush attacks, grapples, and aerial assaults to fight their way through an army of thugs. Combos are fluid and deadly. The gameplay is superb and unlike the first Streets of Rage, each character feels noticeably different. You can power your way through with Max who has a thunder tackle, power slide, and bear hug. Sammy Hunter, or Skate, is my favorite, just because he’s so fast and fun to play as. He speeds through the levels on his skates and I love busting out his Dhalsim inspired Corkscrew kick to destroy enemies with multiple blows. Axel and Blaze are more balanced in comparison and represent the more traditional experience. The balancing act runs smoothly throughout the entire game. There isn’t the frustration and cheap deaths that are rife in arcade brawlers. The designers carefully determined enemy placement and items (like healing apples) so that while the levels ramp up in difficulty, it feels both fair and challenging. Gone are the police bombardments you’d call in to nuke all enemies onscreen. In their place are special attacks that can knock down most thugs, but drain your energy due to the exertion it requires. Your sacrificial “special” attack needs to be used judiciously, especially in critical moments when you’re down to your last strip of health and won’t be able to use that special attack. While the tension is always there and there are some frustrating enemies like the rocket pack wielding Jet, the game never feels cheap in the blows it lands. The music, composed by Yuzo Koshiro (who also did the OST for Actraiser, a score so powerful, it motivated Nobuo Uematsu to up his compositions for Final Fantasy V), nearly steals the show. It’s almost like the punches land in unison with the frenetic beats and the sublime musical pulses are in tune with the violence. Speed and power come in waves and the music tracks are as diverse as the enemy sprites. I’ve often found myself loading up the OST and listening to it in the background. 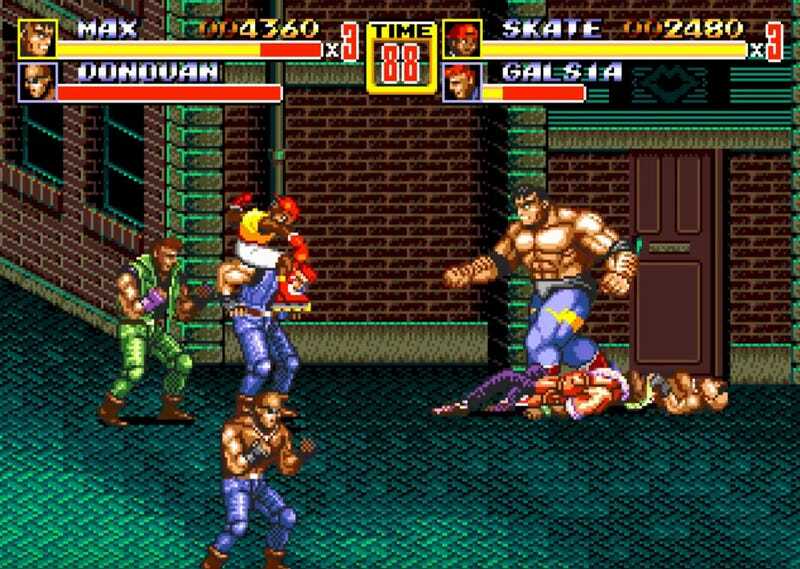 What for me really elevates Streets of Rage 2 is the narrative backdrop. I don’t mean the cutscenes as there are only two that bookend the game (the designers would include many cutscenes in Streets of Rage 3 which arguably marred the experience) as the levels themselves start almost immediately after one another, blending seamlessly. Rather, it’s the story told through the art and visual layout of the levels themselves. Social decay has hit the streets really hard. The amusement parks are hunting grounds for thugs. The arcades are occupied by goons (playing Bare Knuckle) and even the sports arena has become a sparring ground. Initially, the baseball field, the quintessential “American sport,” doesn’t seem that unique as you fight your way through the field. But when you reach the mound, you find a secret platform that takes you to downan subterranean colosseum. There, rabid crowds are cheering for blood and you face off against the wrestling styled champion, Abadede (pretty much an Ultimate Warrior clone). Baseball has been totally corrupted into a blood sport. All this takes on more meaning when you realize the sinister elements have overtaken the factories (Stage 7) and even the office place (Stage 8). Everything has been automated, and even if it’s a subconscious message, the implication is that most of these people have lost their jobs because of social upheaval. They’ve turned to crime out of necessity. It’s no coincidence that the killer robots show up at the end of the factory level when the biker gangs, rocket packed killers, and every other enemy type has failed. The boss fight in Stage 7 is as much against crime as it is the mechanization of everyday life, evidenced by the conveyor belts in the background mass producing robots. One thing I always wondered in games like this was, where do all these thugs come from? Why is everyone so full of “rage?” With the social situation being as desperate as it is, people can only distract themselves with various forms of entertainment. The bleaker the times, the darker their appetites. Every haunt becomes a chance for them to exploit, bully, and murder. Whether it’s the Syndicate that carried out the automation, or they just took advantage of it, it becomes clear Mr. X is above the law (the police are entirely missing in this game) and his army of thugs support his will. The thematic depiction of social corruption is akin to a film like The Warriors where the worldbuilding is reflected in the areas they visit and the enemies they face. Even when you first confront Mr. X, he’s a man in a business suit who looks apathetic, even sociopathic. Seriously, head leaning on his fist, legs crossed, with a nonchalant expression, indifferent to the pain he’s caused. He’s not an evil, pulsing villain. He’s a rich tycoon lording over all of their lives. He even has two deer heads posted on his tiny columns. He’s the only one in the game to use a gun, and a machine gun at that. Mr. X abides by his own rules. In a sense, the entirety of Streets of Rage 2 is a fight against the dystopian corporatization of their society and the establishing of a new type of epic myth. Only we get to control the fate of the characters. We defeat the Syndicate, rescue our friends, and bask in the reprieve our “bare knuckles” provide. But it also makes us ask how permanent a peace imposed by rage can last.